Lathyrus reach heights of between 60 cm and 3 m, and blooms from the late spring through summer with fragrant butterfly like leaves. Go here for information on Annual Lathyrus. They can be grown as trailing plants or attached to a trellis or fence. Some common names for Lathyrus include Sweet pea, Lord Anson's blue pea, Perennial pea, and Everlasting pea. 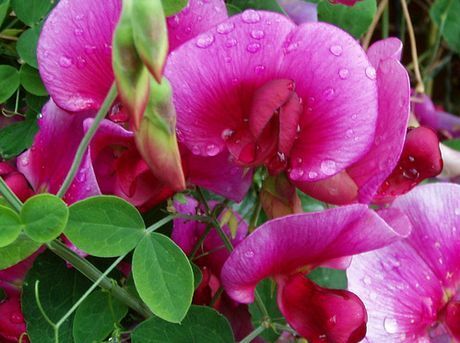 Lathyrus odoratus – Sweet pea by Carl E Lewis; creative commons. Lathyrus latifolius – Everlasting Pea by Amandabhslater. Common Names: Sweet Pea, Bitter Vetch, Everlasting Pea, Perennial Peavine. Pea: Yellow; Golden; Red; Silky beach; Nevada; Marsh; Leaf. Native: Americas, Europe, Asia, Eastern Africa. Growing Region: Annuals: zones 1 to 10. Perennials in zones 4 to 9. Flowers: Annual: early spring, summer, autumn and winter. Perennial: spring and summer. Flower Details: Red, white, blue, pink, purple, yellow. Asymmetric. Fragrant. Annuals: 1/2 inch (12 mm). Before last frost for summer blooms, or in autumn for winter blooms (warm areas only). Spacing: bush: 10 to 12 inches (25 to 30 cm); vines: 6 to 8 inches (15 to 20 cm). Perennials: 1/4 inch. Before last frost or in autumn (warm areas only). Spacing 6 to 12 inches (15 to 30 cm). Sow Inside: Requires some preparation: first chip seeds then apply a nitrogen-fixing bacteria. Use peat pots. Germination time: ten days to one month. Temperature 60°F (16°C). Seven or eight weeks in advance. Transplant outdoors following the last frost or in autumn. Requirements: Full sunlight; perennials can also be grown in light shade. Dig in compost and bone meal to a depth of 16 inches (40cm) before sowing or transplanting. Good drainage. Soil pH 6 to 7. Provide support. Provide trellis. Use a mulch to keep soil cool and retain moisture. Regular watering during the growing season. Deadhead. Miscellaneous: Annual members of Lathyrus are very susceptible to disease so it is a good idea to employ a yearly rotation system. Perennials grow aggressively and can be difficult to remove from the garden. When growing Sweet pea and other Lathyrus members outdoors from the off, it is best to prolong the start of the growing season by protecting the soil with a layer of black plastic; this will help to keep the soil warm. Slits should be made in the plastic and the sweet pea seeds sown at a depth of 6 mm at the start of spring. The plants will take about three to four weeks to germinate, as soon as they get to about 10 cm in height, apply a mulch to the sweetpea plants. 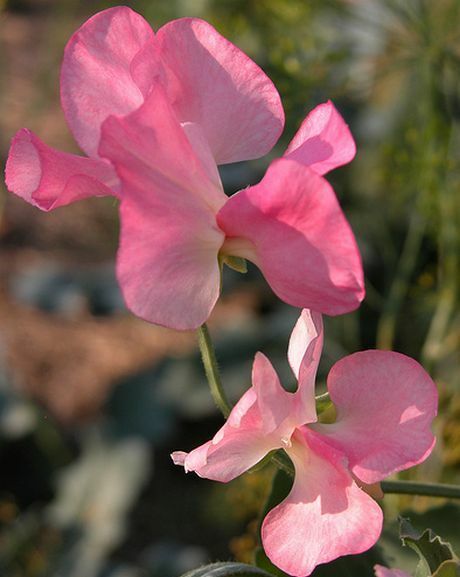 Sweet pea can grow in either a sunny or lightly shaded part of the garden. They prefer a soil of pH 6 to 7.5, as with Annual Lathyrus, the soil should be deeply composted (40 cm) and have bone meal added to it. If first preparing Lathyrus seedlings indoors, then start the growing process about 7 or 8 weeks before due to be transplanted out. First chip the seeds then imbibe them in warm water for a day. They will require to be inoculated with nitrogen fixing bacteria available from a garden centre. The seeds should then take two or three weeks to germinate at 12 to 18 degrees centigrade. Sweet pea should then be transplanted out following the last frost of spring at about 15 to 25 cm apart. Once growing keep the Sweet pea plants regularly watered and remove dead flower heads to promote additional flowers.